These stunning French Shoe Buckles are still on their original card, a rare treat to find. From a French Chateau "sale", these were meant to grace a lady's daintiest pair shoes, to glitter and glow in the candlelight. Mostly worn on evening shoes, for enchanted evenings and waltzes, a lady would surely admire these while flirting shamelessly with a young man from behind her fan. Perfect to attach to a pair of your favorite evening slippers, or to display, card and all, in your boudoir for your collection of French beauties. Perhaps you are creative and will refashion these brilliant sparklers into an elegant necklace and bracelet? 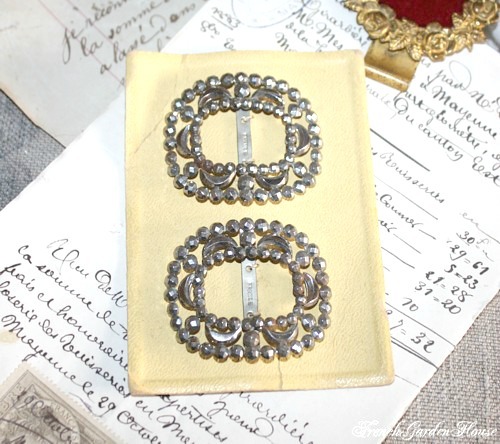 No matter what, I was thrilled to find these still on the original card they were purchased just like this at a shop long ago, romantic and feminine, the cut steel buckles are in wonderful condition and are stamped FRANCE on the buckle. Each measures 1~7/8" x 1~1/2".